Graduate Aptitude Test in Engineering (GATE 2016) Examination Notification Out : Indian Institute of Science (IISC) Organizing Graduate Aptitude Test in Engineering (GATE 2016) Examination scheduled to be held between 30th January 2016 and 7th February 2016 (Only Saturdays and Sundays). The Online Registration start from 1st September 2015 and the Registration close on1st October 2015. GATE 2016 exam for Admission to Postgraduate Courses (Master's and Doctoral) with MHRD and other Government Scholarships / Assistantships in Engineering / Technology / Architecture / Science are open to those who qualify in GATE. The GATE Score also valid for some Government Public Sector Units (PSU) Recruitment. (A) Bachelor's degree holders in Engineering/ Technology (4 years after 10+2 or 3 years after Diploma in Engineering/Technology) and those who are in the final year of such programs. (C) Bachelor's degree holders of Four-year program in Science (B.S.) and those who are in the final year of such programs. (D) Master's degree holders in any branch of Science / Mathematics / Statistics/Computer Applications or equivalent and those who are in the final year of such programs. (E) Holders of Four-year Integrated Master's degree (Post-B.Sc.) in Engineering/ Technology and those in the second or higher year of such programs. (F) Holders of Five-year Integrated Master's degree or Dual Degree in Engineering / Technology and those in the fourth or higher year of such programs. (G) Holders of Five-year integrated M.Sc. or Five year integrated B.Sc./M.Sc. degree and those in the final year of such programs. (H) Candidates with qualifications obtained through examinations conducted by professional societies recognized by UPSC/AICTE as equivalent to B.E./B.Tech. Those who have completed section A of AMIE or equivalent of such professional courses are also eligible. GATE 2016 Exam: The Examinations for all the papers will be conducted as Computer Based Tests only. The Date of exam Between 30th January 2016 and 7th February 2016 (On Saturdays and Sundays). 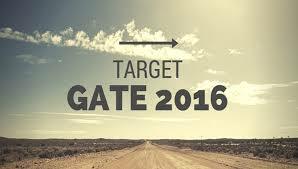 The exact schedule will be given on the GATE 2016 website. Validity: The GATE 2016 Score will be valid for 03 Years Only from the date of announcement of Reults (from 19th March 2016). Application Fee: ₹ 750/- for the SC / ST / PwD category candidates; ₹ 750 for women candidates; ₹ 1500 for all other candidates. The application fee has to be paid only online either through e-challan or through net banking. How To Apply: All candidates must apply Online from 01/09/2015 (Tuesday) to 01/10/2015 (Thursday).